On a beautiful summer day in San Francisco, Isabel and Jeff got married at the SF City Hall. They said that they wanted to keep things simple and not have a huge ceremony and reception, so they invited their immediate family to the ceremony and held a classy yet simple reception at a local restaurant for family a few of their closest friends. 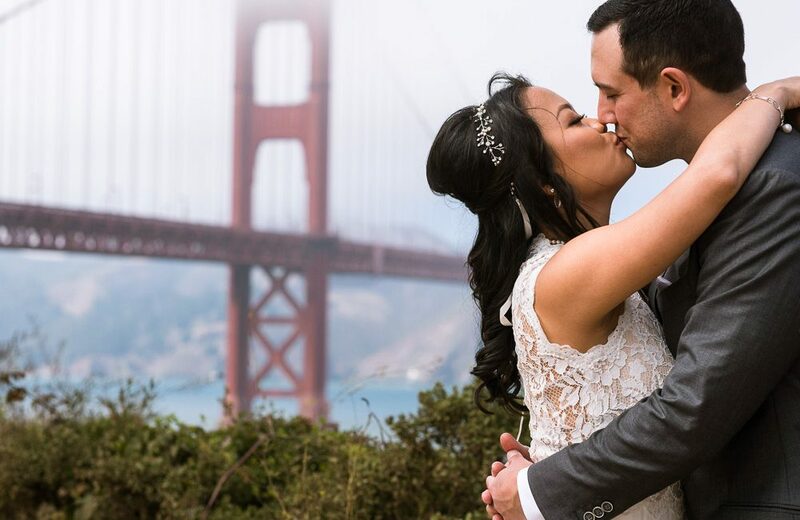 They also wanted to make their wedding as SF as possible, so after their ceremony we headed over to get a few photos with the Golden Gate Bridge before the fog rolled in. If you didn’t know, summers in San Francisco can be quite chilly and the fog tends to roll in every evening. Fortunately, the weather was nice and we made it to the bridge just ahead of the fog, but you can still see a bit in the photos. I’d say 20 minutes after these photos were taken you couldn’t see the bridge at all! Congratulations to Isabel and Jeff. I’m so happy I was able to travel back to San Francisco to photograph your wedding. Best wishes!